The building at 64 Glen Street, best known as the home of J.E. Sawyer & Co., began its life as the headquarters of a different business. In the early 1900's, prominent businessman W. Irving Griffing realized that his livery stable and carriage repository was outgrowing its location on Park Street. He commissioned the construction of a larger building on Glen Street Hill, and planned to move his booming business there. In 1904, Griffing successfully relocated his operation to the new facility that had been built at 64 Glen Street, but shortly thereafter, the advent of the automobile led to Griffing's retirement from the carriage business. Ten years after the new building was constructed, it was sold to Joseph Edward Sawyer and became headquarters of J.E. Sawyer & Co.
J.E. Sawyer & Co. was established in 1883, and throughout its 130+ years, it has sold a variety of goods including parts and accessories for horse-drawn wagons, trapping supplies, industrial hardware, as well as plumbing and heating which it still wholesales today. Before moving to 64 Glen Street, the business occupied a series of four sites throughout Glens Falls. In 1971, the company added a major addition to its Glen Street facility to house new shipping and receiving facilities, warehousing, and steel storage. One of Glens Falls' oldest businesses, J.E. Sawyer & Co. was sold to Rochester-based VP Supply Corp in December 2015, ending the company's impressive stretch of local ownership. In January 2016, the building on Glen Street was sold to Ed Moore, owner of French Mountain Commons and the Log Jam Outlet Center, for $1-million. J.E. Sawyer continues to operate at the location under a two-year lease with an option for additional years. 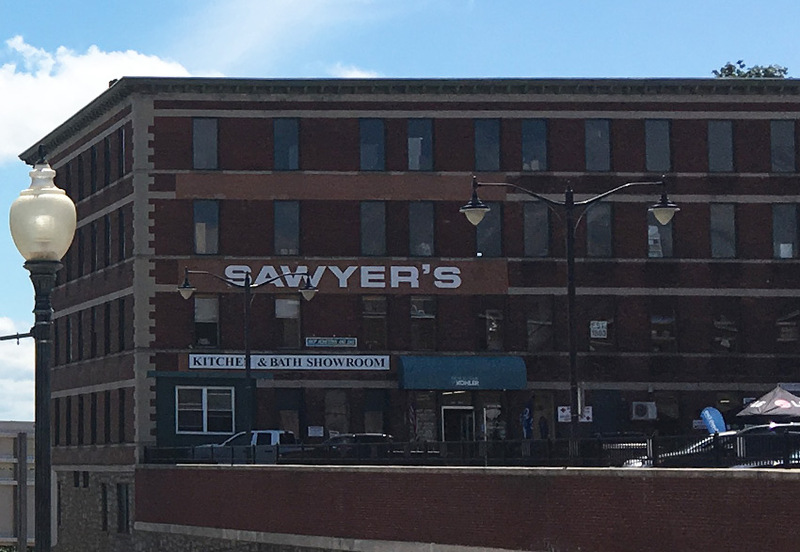 Because of its prime location in Downtown Glens Falls, the Griffing Sawyer building has twice been targeted for redevelopment in recent years. In 2006, plans were announced to tear down the historic building and build a seven-story hotel, retail space, and office building in its place, complete with a walkway over Glen Street to connect the structure to the Civic Center. Three years later, another party expressed interest in repurposing the existing building into a hotel, but retracted its interest after conducting a market study. Before Griffing commissioned the construction of his new building, the plot at the top of Glen Street Hill was home to a sprawling estate built in the mid-1800s for Captain Sidney Berry and his family. In the late 1800s, the estate overlooking the Hudson River was purchased by prominent businessman Duncan McGregor who lived there until his passing in 1895. The land served as a carnival grounds for a few years before being purchased by Griffing.